Tailor made for the executive look and feel in a working environment.Providing optimum comfort and functionality, an executive office chair is built to enhance productivity and performance in the workplace. 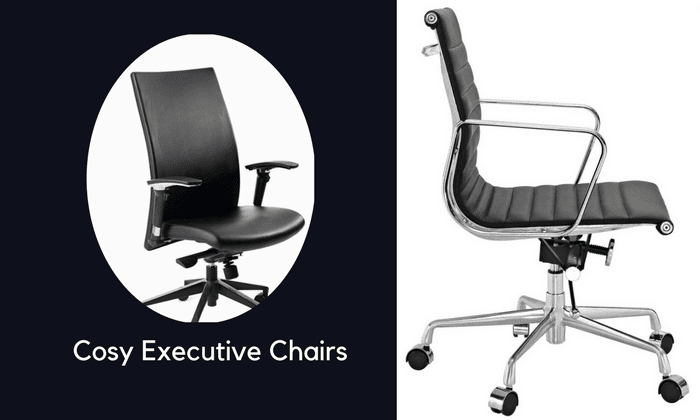 This choice of office chairs is perfect for senior executive offices and office boardroom , these luxurious seating products are well known and preferred for their outstanding features, such as adjustable height, tilt and arm rests, high back designs and seat depth adjustment, to name but a few. Executive office chairs can be collaborated with any of our executive desks to achieve a professional, polished look. There is a wide selection of upholstered finishes for you to choose from, including leather, vinyl and mesh. For added convenience, many of our office executive chairs are also available in various color options. Midback -basic swivel & tilt mechanism with tension adjustor. Gas-height adjustor on Slimline base (Die-cast Polished Aluminium) & 60mm Dia. Twin wheel castors for carpeted floors. Batik Midback -basic swivel & tilt mechanism with tension adjustor. Metto Fully Uphostered Highdback Chair. Fully synchronous mechanism with gas height adjustment on Arched polished alu. base & 60mm Dia. Twin wheel castors for carpeted floors. Complete with Poly-chrome Height adjustable armrest. COM - Please provide 1m for back & 0.75m for 1 seat or 1.4m for multiples of 4 seats. Metto Fully Uphostered Midback Chair - Fully synchronous mechanism with gas height adjustment on Polished alu arched base & 60mm Dia. Twin wheel castors for carpeted floors. Complete with Poly-chrome Height adjustable armrest. COM - Please provide 0.85m for back & 0.75m for 1 seat or 1.4m for multiples of 4 seats. -Fully synchronous mechanism with gas height adjustment on Polished alu arched base. Complete with Poly-chrome Height adjustable armrest. (Image features Lumbar Support(Optional)) COM. Please provide .75m per 2 seats. Best executive buy for company executives. Late Highback - Fully synchronous mechanism featuring 5 position lock & tilt tension adjustor. Gas-height adjustor on Arched polished alu. Base & 60mm Dia. Twin wheel castors for carpeted floors. Complete with Poly-chrome height adjustable armrest. COM - Please provide 0.9m per back & 0.7m for 2 seats. Integral cantilever sleigh-frame (Round tube 24.5mm dia. x 2.5mm wall thickness) black epoxy coated . Single shell made of Plywood. Open cell back & seat foam. Single shell made of Plywood 14mm thick. 20mm Layer of chipped foam for durability. Backrest with VP45 medium density Open cell foam & seat with VP65 high density open cell foam complete with Boomerang Nylon Armrest. COM - Please provide 0.85m per back & 0.8m for 2 seats. Belinda Highback - Fully synchronous Donati mechanism featuring 5 position lock & tilt tension adjust according to users weight/height with seat depth adjustment. Gas-height adjustor on an arched polished aluminium base & 60mm Dia. Twin wheel castors for carpeted floors. Complete with Poly chrome heigh adjustable armrest. COM - Please provide 0.9m per back & 0.7m for 2 seats. Fully synchronous mechanism featuring 5 position lock & tilt tension adjust according to users weight/height. Gas-height adjustor on a 640mm dia. black base(glass-fibre reinforced Nylon) & 50mm Dia. twin wheel castors for carpeted floors. Complete with flexi armrest. COM - Please provide 0.95m per back & 0.7m per 2 seats. Fully synchronous mechanism featuring 5 position lock & tilt tension adjust according to users weight/height. Gas-height adjustor on a standard Polished aluminium base & 50mm Dia. twin wheel castors for carpeted floors. Complete with flexi armsrest. COM - Please provide 0.9m per back & 0.7m for 2 seats. Fully synchronous mechanism featuring 5 position lock & tilt tension adjustor. Complete with Flexi Arms. Gas-Height adjustor on an arched Polished aluminium base with 60mm Dia. Twin wheel castors. COM - Please provide 0.25m per back & 0.75m for 1 seat or 1.4m for multiples of 4 seats. Integral Cantilever sleigh-frame in bright chromed finish. Steel-tube backrest (epoxy coated) upholstered in fine weave mesh. Plywood seat with moulded foam. COM - Please provide 0.25m per back & 0.75m for 1 seat or 1.4m for multiples of 4 seats. Protype Meshback Operator with adjustable headrest. Donati 24 hour syncronous mechanism with seat depth adjustment. Injection moulded Nylon backrest upholstered in mesh featuring adjustable lumbar support. Zen-Multifunctional Armrest with Gas-height adjustor on Arched black & polished aluminium base with 60mm diameter twin wheel castors. Protype Meshback visitor armchair. Cantilever sleigh-frame - silver epoxy coated. Injection moulded Nylon backrest upholstered in mesh featuring adjustable lumbar support & plywood seat with High Density moulded foam. COM - Please provide 0.75m for 1 seat or 1.4m for multiples of 4 seats. Awesome! Highback - Forward knee-tilt mechanism with tension adjustment knob. Gas height adjustor on a Standard black base (glass-fibre reiforced Nylon) & 50mm Dia. Twin wheel castors for carpeted floors. Complete with flexi armrest. COM -Please provide 1m per back & 0.75m for 2 seats. Awesome! Midback - basic swivel & tilt mechanism with tension adjustment knob. Gas height adjustor on a Standard black base (glass-fibre reiforced Nylon) & 50mm Dia. Twin wheel castors for carpeted floors. Complete with flexi armrest. COM -Please provide 0.85m per back & 0.75m for 2 seats. Awesome! Visitor - Integral cantileve sleigh-frame with black epoxy coated frame. Single shell made of Plywood. Backrest with VP45 medium density open cell foam & waterfall front plywood seat with VP65 high density open cell foam. COM - Please provide 0.85m per back & 0.75m for 2 seats.